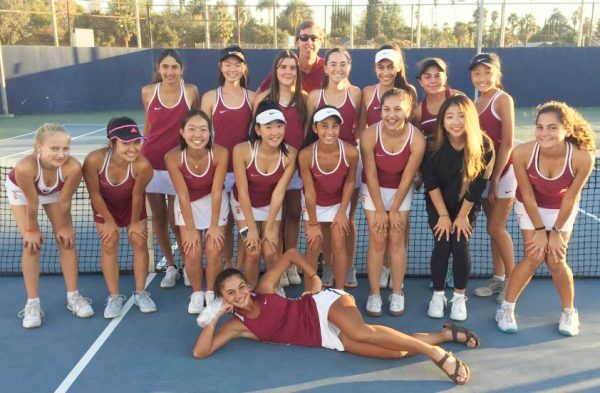 The La Cañada High School varsity girls’ tennis team is one win away from playing its first CIF Southern Section championship match since 1978. The squad, accompanied by head coach Will Moravec, includes Sonia Bhaskaran, Ashley Chun, Tsehay Driscoll, Eliana Hanna, Marlene Hess, Annabelle Kevakian, Kristy Kim, Stacey Kim, Anabel Massabki, Solenn Matuska, Sophia McKenzie, Artis Phillips, Sarah Pyne-Jaeger, Sophia Razavi, Natalie Son, Lisa Sun, Maya Urata, Maya Vasisht, Sydney Wang and Elise Wu. Longtime La Cañada High School varsity girls’ tennis coach Will Moravec finally had his wish granted this season, and it has certainly benefitted his program. The added depth and placement in Division 2 allowed the Spartans to make an impressive postseason run, reaching the CIF Southern Section Division 2 semifinals following a 10-8 victory over Claremont on Monday. La Cañada traveled to Long Beach on Wednesday to take on Poly in a semifinal match. Should the Spartans come away with a victory, they would advance to the final match against the winner of the other semifinal match between Aliso Niguel of Aliso Viejo and Chino Hills Ayala. The Spartans have not played a CIF-SS championship match in 40 years. They finished as runners-up against Corona del Mar in 1978 and won the Division 3A crown in 1977 by defeating San Marino. The Spartans opened the playoff tournament with a 14-4 victory over Los Angeles Brentwood and followed that with an upset win over No. 2-seeded Redlands, which finished the regular season unbeaten. The Division 2 championship match will be played at the Claremont Club this Friday, Nov. 9, at 11 a.m.